Close Your Eyes; It's Tight. I come away from experiencing the Intima a little disappointed in Lelo. They make some truly amazing toys, and I love that they've turned to accessories. They seem to have come up short with their first blindfold, however. It feels amazing, but it just doesn't function all that well. 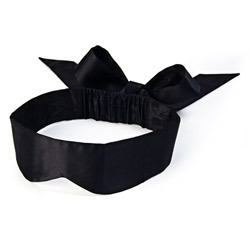 I haven't yet found a perfect blindfold, but I am certain that this is not it. The Lelo Intima blindfold feels great-- at least when it's not on your head. I just can't decide with this product. It's 100% silk and looks truly lovely. However, if you don't put it above your ears it slides down immediately. If you do, then your ears might stick out 90 degrees from your head, looking a little awkward. After discovering that the thick sides caused this, and not wanting to take a pair of scissors to a $50 blindfold, my girlfriend and I tried twisting the material so that the sides above the ears were thinner. It dramatically improved things. However, for her, it was always either slipping down, uncomfortably tight or pushing her ears out. For myself, I discovered that I liked it exceedingly tight. It was pressing against my eyes so that I couldn't physically open them. From that point on, I had a wonderful time. Still, I don't think I will always want to have somewhat sore eyes after a long session. When the Intima's not tight enough to force the eyes closed, I found it wasn't very useful. It either slips down, or, if you make sure not to move, you can see out the bottom of it. Since you will often be lying on your back with the action you're not supposed to see below you, the ability to see out of the bottom ruins the entire purpose. Ultimately, I think Lelo doesn't take full advantage with the Intima. They weaved together a blindfold that feels wonderful, but that's not enough. I want one blindfold, no matter how expensive, to serve any occasion. I will keep the Intima, of course, because it feels and looks wonderful. And in time I will use it and love it, but it falls short in some important areas. Lelo takes a lot of time to design tremendous vibrators, and I can't help but feel that they dropped the ball a bit on this one. One other small criticism is the box. The folded-up Intima is just a little too puffy to fit comfortably as you would expect. Unlike all other Lelo products I've owned, I don't like keeping the Intima in the box. Combining all these shortcomings, I don't think it's worth $50. If it were $25, it might be a different story. Even though in general I wouldn't recommend this product, my experience at times has been wonderful. The Intima does have a lot of potential in certain circumstances. The first time we used the Intima, she tightened it around my eyes and wrapped my wrists in Lelo's chainlink cuffs. The combination is exhilarating, and after awhile with she having teased me plenty, I found myself hanging off of the bed. Arms over the head and blindfold keeping my eyes shut, I felt wonderful, and she just seemed to eat that up. I know that it wouldn't have been the same with the blindfold, but at the same time I feel like the intense, passionate and very active moments like this are when other pieces of cloth would do wonders. The Lelo's silky smooth feel should also be perfect for more gradual, romantic and candlelit occasions. I haven't yet found a way to use it in this way, and so the Intima is not the be-all and end-all of blindfolds. I must keep looking. Yes, too pricey. thanks for reviewing. Thank you for viewing Intima silk blindfold review page!